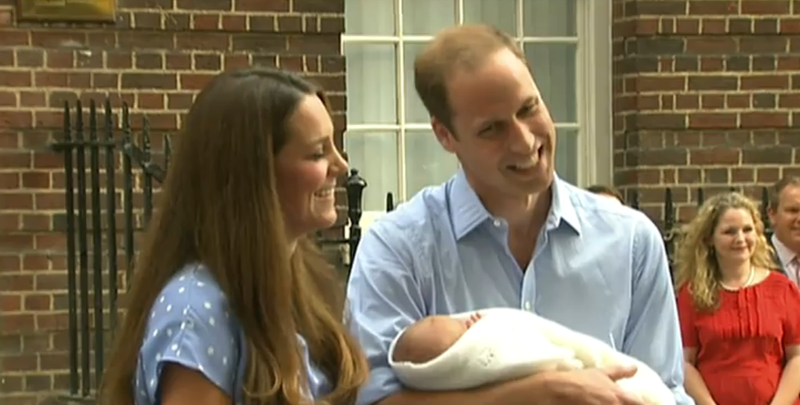 The World got a glimpse of the U.K.'s Royal Baby today. Princess Catherine and Prince William carried forth their new born son and very possible future King from St. Mary's Hospital in London for the rest of us to see. When a reporter asked a question (inaudible but very possibly regarding the newborn's name), William responded with feigned laughter and then said, "Wait and see means wait and see". In between his fake funny and his spoken words, the Prince tilts his head to his right (slightly away from the questioner), configures his mouth in what is a mild fear configuration and inhales through closed and mildly clenched teeth while making a slight hissing sound. This is a type of "low level fear" expression indicates that someone (either the speaker or the listener) has just crossed over a line of acceptable behavior or an outcome has occurred which may have some unpleasant/unwanted ramifications. It is not a full-on fear expression by any means. If it had been even a mild nonverbal signal for true fear, the neck would never have been tilted to one side, the eyes would be opened wider than baseline (here they are partially closed) and the corners of the mouth would be pulled tighter laterally with an added downward vector. This nonverbal indicates a subconscious desire to "save face" - either for oneself or the other person while still communicating that a faux pas has been committed or a bad outcome has been obtained. This nonverbal expression engenders rapport and William certainly uses it to his advantage here. Though it is not the case here, this head tilt, low level fear expression may be seen coexistent with a Rationalization, Rapport, Empathy Expression (R2E2) and in such a setting it signifies an asking of permission and empathy. What other very telling body language did the royal couple display in this short video? Blessings to a Mother, Father and a beautiful new life.